I might be an advocate for online freelancing but I don’t want people to be uninformed or be misinformed with the serious risks associated with this kind of work. To many, online freelancers may seem fortunate enough to work on their own, have flexible schedules, and earn more compared to those ones working in the office, but don’t get carried away. 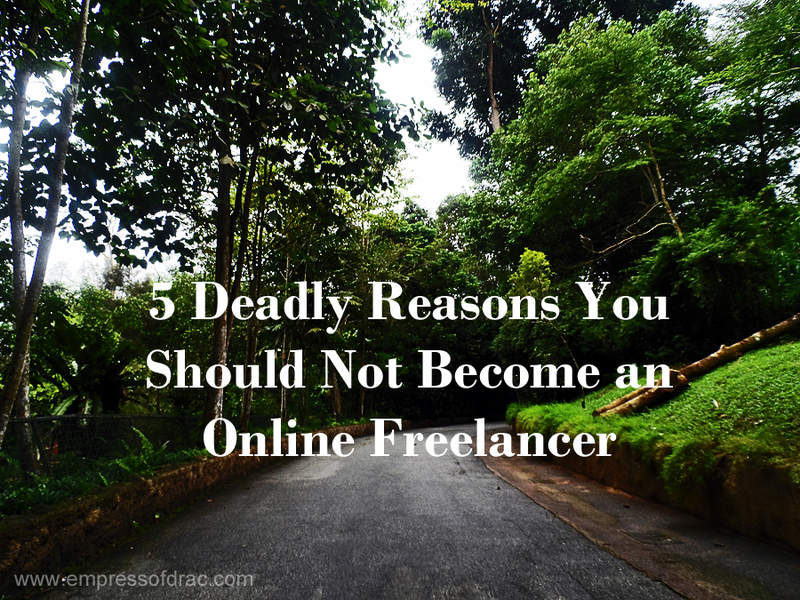 Online freelancing has deadly (literally) risks and you should know about this before you jump into the bandwagon. Unlike working in an office wherein your boss or the owner pays for every facility and utility you use, in freelancing you pay for everything. From the electricity, computer, internet, software subscriptions, down to the repairs and any work-related emergencies – you are the only one responsible for them all. Compare that to those ones who work in a traditional set-up and you would surely choose the latter because it’s hassle free. You only need to focus on your work. As an online freelancer, I keep tab on the additional obligations that I need to properly manage. Working on my own teaches me to become self-efficient, self-reliant, and most of all I learned to manage my finances the hard way. If you are not willing to face this kind of responsibility, then online freelancing is not for you. This is one of the main reasons why most people who are new to online freelancing have quit easily. They quickly labeled the industry as unstable and hurriedly look for a “regular” job. While it is true that you can lost your client anytime, it is also a fact that 80% of the time, the responsibility of making your client stay is in your hand. Online freelancing is like having your own business. You need to know how to keep a constant flow of loyal clients that are willing to work and stay with you. For me, the most important aspect of freelancing is “Client Retention“. Anyone can attract a client right away but keeping them for good is where your real skills can be measured. Unlike regular jobs wherein insurance and health benefits are already part of the compensation, in freelancing it is the freelancer’s responsibility to get them and ensure they are being diligently paid. For those who don’t want to be bothered by these things, then freelancing is not for you. Online freelancing is fully dependent on the internet. If a catastrophic event would lead to the annihilation of the internet, then its bye-bye time for all online freelancers. This could mean the end of your source of income, the end of your world, the end of Facebook, and end of everything. ): But, you need not to worry actually because you won’t be alone. The end of the internet would mean unimaginable lost of income especially for big corporations. They would surely ensure that the world wide web would keep on going. In ordinary cases though, the problem with internet is only limited to slow connection and brown-outs more especially here in the Philippines. The simple solution is to get more than one internet connection (from different internet service providers). You can get a cable broadband connection and back it up with a data connection that you can use during brown-outs. You can also buy an electric generator to lessen your work distraction during brownouts. You can literally lost your sanity if you don’t know when to relax and play. This can happen to new freelancers who forget that getting more clients is not the main goal. The main goal is to make them stay and choose you every time a new project comes in. The moment you accepted more clients than you can handle is the time you increase the probability of losing all of them. One of the biggest advantage of online freelancing is you can work anywhere and in my case, anytime. But, these don’t come in easy package. You would only rip the rewards if you work hard and you know how to manage your time properly. For those who are planning to embark in this life changing career twist, you should remember that nothing of high value can be gotten in an instant (except for those people who were born in rich and wealthy families). Online freelancing is not a quick-rich scheme that promises instant cash. It is a risky career move that doesn’t only need hard-work but persistence, endurance, time, patience, and most of all resourcefulness. Are you planning to go full time in online freelancing? Share your enthusiasm and fears below. Nice thoughts and very true. Only I want to correct the use of word Lost. I believe it should be, ‘You can lose your client…’ Thank you for the tip.